Soldier of Flight. 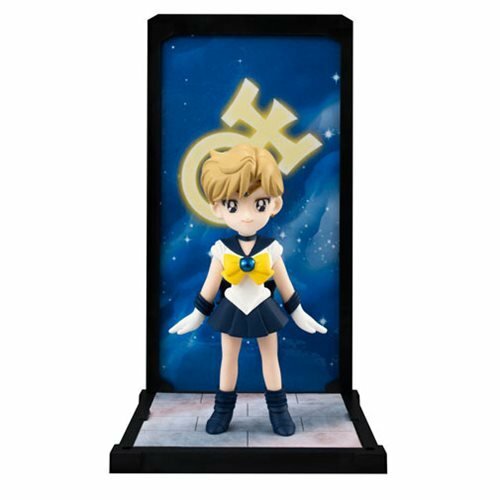 Now that we've seen the introduction of all five Inner Sailor Scouts, the Tamashii Buddies Sailor Moon takes it to the next level by welcoming the Outer Senshi to the family - starting with the soldier of flight, Sailor Uranus! The set includes a background panel with the Neptune mark to recreate her transformation sequence. All Tamashii Buddies stages can be stacked, so you can display your Tamashii Buddies collection any way you like! Each character comes in collectible, displayable packaging! Measures approximately 3 1/2-inches tall. Ages 15 and up.